ACOW continues to advocate for appraisers and this page is dedicated to let you see what we have done. If you do appraisals for property owners who intend to donate the property under IRS rules, you should be aware of the new IRS appraisal requirements, including a required statement that must be in every report. In January 2018 ACOW introduced two of our own bills and intercepted a third, which was modified and submitted. Below is the summery of those bills which was on the front page of this site earlier this year. -Statute of limitations – Setting time limits in which litigation can be filed against an appraiser and by whom. -Inactive License – Allowing up to 96 months to reactivate and inactive license or certification. Note: These two bills were combined and are now SB 6457. The bill made it through the Senate Committee hearing and the Senate Rules Committee and is on the senate floor today! -Amendments to RCW 18.310.150 adding Customary and Reasonable Fee; requiring AMC’s to adequately compensate appraisers based on the VA fee schedule with modifications, mandating quicker payment, adding further protections to the appraisal report and the appraisers signature, making AMC’s responsible for background checks, and setting precedence on jurisdiction in the event of dispute. 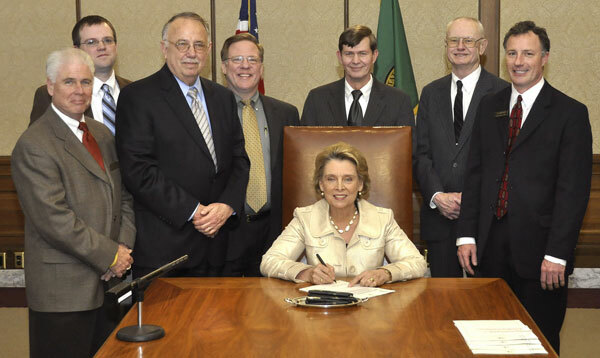 On January 17th several ACOW board members and our lobbyist, TK Bentler, met in Olympia to discuss the bills mentioned. Afterword’s many of us then met with some of our respective district legislators to discuss these subjects. TK also introduced some of us to representatives and senators supporting a couple of these bills. On Tuesday, January 30th ACOW board members along with members were testified before the representatives hearing committee. On February 1st members of the ACOW board testified before the senate hearing committee. The bill then went to the rules committee. So, what’s next? As these bills make their way through the legislative process, It is important you become familiar with each. We encourage you to call and talk to, or email your support of the bills with your state representatives and senators from your respective districts throughout the state! They need to hear from you, the boots on the ground! In June 2016 Bill SSB 5597.SL (Real Estate Appraisers – Licensure – License in Other State) was passed and signed into law. This bill allows certified/licensed appraiser from other states to obtain credentials in Washington, providing the appraiser licensing and certification program of their state is in compliance with 12 U.S.C. Sec. 3331-3355,5. 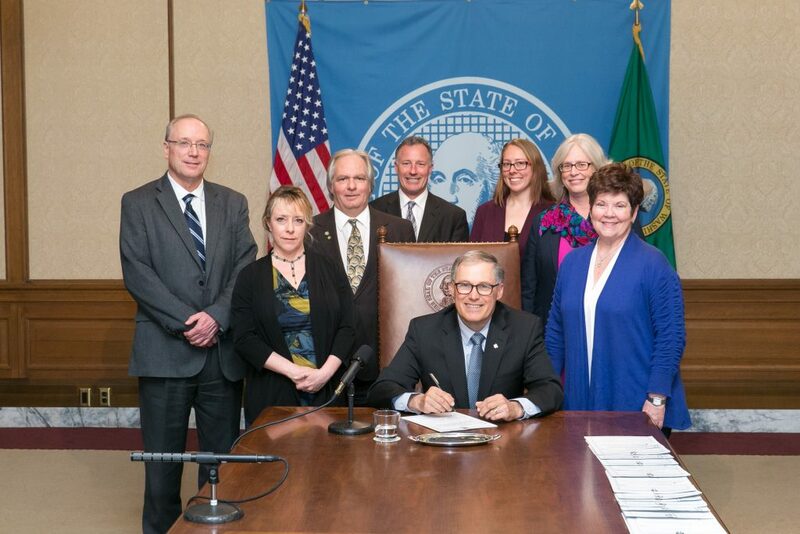 Governor Jay Inslee signs Substitute Senate Bill No. 5597, March 31, 2016, relating to real estate appraisers. Shown from left to right. Jerry McDonald, Administrator, Real Estate Programs; Dee Sharp, Appraisers Program Manager; Bob Mossuto, MNAA, ACOW Board Member; T.K Bentler, ACOW Lobbyist; Stephanie Sams, Policy and Legislative Analyst, Director’s Office; Kathleen Drew, Assistant Director for Business and Professional Licensing; Senator Pam Roach, President Pro Tempore and Chair of the Senate Government Operations and Security. Seated in front is Governor Jay Inslee. H-3202.1/14: Allowing appraisers to place a lien on property for unpaid balances for services rendered and H-3317.1/14 Creating an inactive certification, license, or registration status for real estate appraisers. Unfortunately, these bills were not passed! 2011 – Washington AMC Law: One of the most important bills affecting appraisers in this state was the passing of Bill 3040, leading to Revised Code of Washington (RCW), Title 18, Chapter 18.310 – (State AMC Law), which regulates Appraisal Management Companies. This bill took effect in July, 2011 and ACOW played a big part in getting it passed. In 2016 the Supreme Court – Hirst Decision dramatically affected any development of individually owned parcels throughout the state. New water wells were prohibited unless the Property Owner could provide absolute proof that any withdrawn ground water would not affect other property or the ability of fish to swim up rivers and streams. This decision caused county assessors to ‘devalue’ vast tracts of land in the affected areas. Good News – The House and Senate have approved, and the Governor signed, a bill to restore the ability of property owners to have wells dug so that potable water can be obtained. It took effect immediately upon the Governor’s signing on January 18th, 2018. The details of exactly how ‘water rights’ will be restored to the affected areas are not clear. It appears to leave it up to the Counties and Department of Ecology to work out what and how things will be done. So it is unknown if this will be a smooth process. Appraisers should continue to monitor this situation in their local areas. Restoring of water rights will result in the modification of property values upwardly. This may also increase the number of vacant land sales in outlying areas by people who decided to sit on their property after the Supreme Court decision until the issue was resolved. We want to thank Dave Towne for this important update. The new bill can be seen below. As always, should you or someone from your office have an issue or idea and would like the ACOW board to address it, please contact us at info@acow-wa.org or call 1-206-622-8425.